Buckets anyone? I'm having a give-away this month and the winner will receive one of my bucket pendant necklaces that is inspired by a song by my sweet friend ( and Canadian Idol contestant ) Carly Rae Jepsen. All you need to do is to scroll through my shop, including my sold items and comment here on which item (s) you'd like to see more of. My name is Alexandra Lanzarotta and I am Carly's mom. 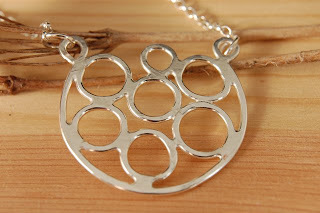 I just happened to come across your lovely "Bucket" necklace when I was looking on the internet for any new articles on Carly. Wow!!! You have designed a "Bucket" necklace...how cool is that!!! So I browsed through your site and I love all of your designs...you are very creative! I especially like the silver roses you have done. Anyways...I hope you have a wonderful day and I will let Carly know all about your necklace giveaway in her honor. Your creations are beautiful. I love the way you can capture the colors and beauty of the stones you use. I like the denim ring. BU the one that blows my mind is the Summer Rain. Amazing colors. I love your creations! These are pieces that I would definitely wear for their organic feel and uniqueness. I especially like the Island Magic necklace! Thanks for your lovely comments! The island magic necklace has been quite popular here in Norway actually. I love absolutely all in your shop... you know, but I choose Promenade - Bezel Set Turquoise Pendant Necklace. When I see it at first time, I fell in love with it!!! Ok I know I said it was not fair for me to enter but my gosh no one is entering~! I LOVEEEE all your jewelry why do you make me choose just one lol... Ok my all time favorite was the Amethyst ring you had I LOVED IT ... my daughter is Amethyst I am Opal other daughter and Hubby Saphire so I love all that deal with those stores ..oh and I LOVED the honey OPAL that was soo pretty and I LOVE that blue Opal you still have..COME ONE PEOPEL BUY hee hee sorry :)...LUV U lots Sabine your such a great Gal~! I have something specila up my sleve for you.. I love your Isabel -Hand Forged Sterling Silver Twig Pendant- Necklace! I think you should do more pieces with nature as a main theme. Thanks! I love the Morning Mist - Bezel Set Prehnite Cabochon Pendant Necklace. I think the Northern Breeze - Bezel Set Turquoise Cabochon Pendant Necklace is simply gorgeous. Really cool. Thanks for the contest! The bucket necklace is stunning and I hope I win!!!! I really loved your Stained Glass Pendant. I would love to see something like that again perhaps with matching earrings. I love the bucket design necklace and the "cheerio" earrings which feature simple circles and have a natural, beautifully organic look. I'd love to see more of these! Your work is lovely. Cheers! Your Turquoise Jewelry leaves me breathless! It is so beautiful, I can't even choose a favorite. I also love the copper pieces and think that might be something to produce more of. It is such a warm, lively metal and so becoming on most complexions. Thank you for the giveaway. The Island Magic - Hammered Organic Pebble Pendant Necklace is my favorite. It is beautiful! Ohhhhhh your jewelry is amazing!! I love it all!! but the Stranded - Turquoise Necklace ohhhhhhhhhhhhhh and what about Moonlight Romance - Sterling Silver Bezel Set Moonstone Ring???? I'm in love!! gorgeous jewelry! I did not see anything on your site that I don't like! I like your use of stones, but I really like how you make pieces with just silver that have the effects of stones (like the funky dunky earrings). Very nice work! I like the Blue Cabachon lapis pendent necklace. The Stranded Turquoise Necklace and other turquoise jewelry is just magical, the color of turquoise stone cannot be exactly duplicated except by nature, so wearing this beauty is powerful and inspiring, to wear the earth gem proudly! Bubbles depicted in jewelry are also an awesome experience! I love the Stranded - Turquoise Necklace-more like this please!! I LOVE the Looks Like Love - Sterling Silver Heart and Flower Pendant Necklace- SO pretty! :) Thanks for the cool giveaway! I love this jewelry! I love the After The Rain - Prehnite Pendant Necklace because of its combination of metal with stone. I'd love to see more pieces like this one. Vry unique and beautiful. 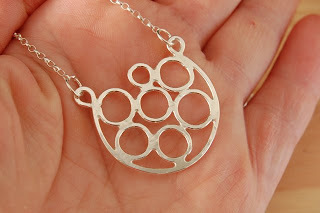 Such beautiful jewelry....I love organic, rustic silver jewelry, esp. items inspired by nature and prefer purchasing jewelry from artisans and not from larger companies. I bookmarked the following so that I can revisit them on my etsy account in the future (when I'm flush with $$ or having a birthday): isabel twig pendant necklace, high season - new life branch pendant, and the rustic poppy ring (normally not drawn to bronze, but it's just lovely....and the bronze defines it as a poppy ring). Hi Sabine - your jewelry is gorgeous I'm so happy I stumbled onto your blog! A couple of my favorite from your shop are the Another Falling Star - Sterling Silver Molten Pendant Necklace, and the Stormy Weather - Sterling Silver Prehnite Ring. I also adore this bucket necklace, thanks for a chance to win. I appreciate very simple pieces. Nothing flashy but still have detail. Island Magic and Bucket are my favorite by far! I'd like to see more earrings like Rain Dance, bracelets with crystals and gems, and necklaces like Fearless. ur works are amazing..u have a magic hands on that..
That morning mist is a lovely piece. I tend to always look for stunning necklaces/pendants because they become the focal point to a great outfit. I'd like to see you make ear cuffs. These are hard to find, esp wonderful designed ones. I love the natural stones. It's hard to improve on nature. Everything you have is beautiful. I will be back. I love the Stranded Turquoise Necklace! I love all turquoise jewellery so anything like that would be a plus to see more of. i'm a huge fan of bracelets. you need to add more of those! I love the hand forged twig necklace! LOVELY! Your whole shop is wonderful!!!!! Your jewelry is beautiful! I especially love the turquoise items. I've really been enjoying hammered silver items lately, so maybe you could add more of that type of thing? Thanks for the chance to win. I like the Promenade - Bezel Set Turquoise Pendant Necklace, especially how you paired the silver frame around the turquoise stone. gorgeous color scheme! Everything is so beautiful! I love the dragonfly earrings. Thank you! i love the Clementine - Sterling Silver Hand Engraved Pendant Necklace! I adore the Face Your Fear - Inspirational Tag Necklace With Red Garnet and would love to see more distressed neclaces. I really like your Rain Dance Twig Earrings...they are just beautiful! I'd like to see more of lineal patterns, like "Isabel -Hand Forged Sterling Silver Twig Pendant- Necklace", "Fire And Water - Abstract Sterling Silver Pendant Necklace," and "High Season - Sterling Silver New Life Branch Pendant Necklace." I really like the high season & fire & water. I also like the inspirational pendant and think a collection of these with different sayings and stones would be great! It is SO tough to pick a favorite...your beautiful work is so unique. I just love the Prong Set Agate Geode Pendant Necklace -- and your other pieces created using natural stones. More of the quirky, one of a kind earrings please? Like the Surrender - Oxidized Sterling Silver Earrings With Freshwater Pearl, which I adore! I love poppies and therefore love the Rustic Poppy Ring! You have some stunning jewelry but because I'm a fan of copper and silver together then I would love to see more jewelry like your Summer Wind earrings. They are gorgeous! i love the morning mist- bezel set prehnite cabochon pendant necklace. that is such an unusual stone. so anymore jewelry with that in it would be beautiful. all of these creations are gorgeous. i wish i could afford a new necklace right now. Love your store, particularly the pieces with stones - you have a good eye for colour and pattern! All your pieces are very pretty. I really like the Green Brazilian Agate Pendant Necklace. Your jewelry is beautiful! If I had to pick one favorite, I would say the "Walk On Water- Sterling Silver Poppy Pendant Necklace" is gorgeous. Beautiful jewelry, love the Green Chrome Silver ring. Hmm, here in Los Angeles, cuff bracelets continue to be Hot. I love your Geode necklaces, geodes would look great on a cuff or small shards in earrings. Thank you, great giveaway. I love this ring! The design is simplistic elegance at its best. I favorited your shop on etsy...your stuff is gorgeous! I am a HUGE fan of big stones on rings, and that green one you have is my favorite...more of that! wow beautiful work! I love your moonlight romance ring and I would LOVE to see more rings like it :O) or even just smaller rings! :O) grove79 at aol.com beautiful! Your jewelry is beautiful. I think your forged silver rings are what I would like to see more of. My favorite is the freckles ring-love it! Everything you made is wonderful, I particularly love Green Chrome Silver ring. Keep up the beautiful designs!!!!!! Such lovely jewelry in the shop! I especially love the Isabel Sterling Silver Twig Pendant necklace. Stunning! I would love to see more rings! Especially more like the Primrose-Pink Ruby Ring-Sterling Silver with different gemstones! You make such beautiful jewelry! I would love to see some forged silver bracelets to match the necklaces! Beautiful jewelry! Such lovely works of art! I love the Radiance- Prehnite Pendant necklace, it's very beautiful!